appbase.io APIs are 100% RESTful, work with JSON and are compatible with Elasticsearch. The publish/subscribe streaming is supported via HTTP Streaming and Websockets. There are some places we differ from the Elasticsearch. 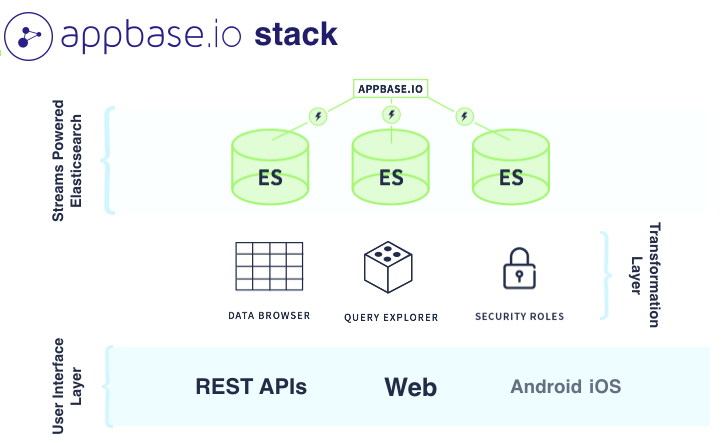 Most importantly, a user in appbase.io only has access to an index or indices, the cluster APIs are managed by appbase.io. Full list of supported endpoints is available at https://rest.appbase.io. appbase.io offers following advantages over running a raw Elasticsearch cluster / index. Built-in Realtime Streaming - appbase.io is the only Elasticsearch service offering a realtime pub/sub API for the entire Elasticsearch Query DSL. Security - Read and Write access credentials so your app can directly connect to the appbase.io DB. Zero Ops - Automated provisioning, scaling, logging and daily backups so you can enjoy a peace of mind. An Active Ecosystem - From UI toolkits to build search interfaces and map UIs, to the leading Elasticsearch data browser to a GUI for writing queries to backend data connectors to import data from SQL, MongoDB, JSON, CSV sources into Elasticsearch, we are actively working on open-standards to improve accessibility of building apps with appbase.io and Elasticsearch. No Vendor Lock-in - Hosted APIs often come with a huge lock-in cost. appbase.io is offered as a hosted API as well as a cloud native software container, offering a consistent experience without becoming a walled garden.